Chi means many different things to different people. Sometimes it correlates roughly with energy or force, but the way I hear it used it more often than not means "I don't understand". As such it is a useful word, as it rapidly makes you aware of the gaps in the speaker's knowledge. When I ask someone a question about Tai Chi and they use Chi as an explanation I know not to bother asking them again - they don't understand it themselves. There is nothing mystical or supernatural about Tai Chi or in it's application as a formidable combat art. However peoples natural inclination to immediately assume such forces are at work when they don't understand how something works rears it's ugly head frequently with Tai Chi. Conversely if they believe supernatural/mystical power is at work then they don't understand what is really going on. This is certainly true for Tai Chi! My personal observation reveals a very close correlation between those who don't understand Tai Chi and those who attribute things to Chi. The following table illustrates how to interpret statements people make involving Chi. He used Chi. I don't understand how he did that. I use Chi. I don't understand what I'm doing. Use Chi. I don't know how you should do it. I lift my arms using Chi. I don't understand how my arms lift. I transfer my weight with Chi. I don't understand how my weight changes. Having said all this it should be noted that to some people the term Chi has no mystical or supernatural interpretations. To them it corresponds to concepts which are consistent with the laws of physics, and does not indicate a lack of understanding. This will usually be quite obvious from the way they use the word. It is when Chi is used to explain physical manifestations but cannot itself be explained physically that you should find a better source of information. It has sometimes been said that if you take a break and then come back, you feel much more proficient. However wise masters will say that this is an illusion. The fact that you are reactivating all of your "tai chi muscles" after a break, means that you are suddenly filled with a rush of endorphins and sensations you misinterpret as proficiency. Do not get trick by this effect! One thing however it is certain is that if you have a break in your training, your body will start to tense up, as you naturally adopt less optimal structures in your daily life. When you come back to it, you have an opportunity to notice which parts of your body have lost their fluidity. Pay attention to this, for it is a direct indication of bad posture in your daily life. Does your right shoulder feel exceptionally stiff? No doubt you have a natural tendency to to tense it for some reason. What a great clue to investigate the cause which may or may not be obvious. If you have a specific injury (such as my twisted knee), although it might be painful or weak to begin with, the benefit is that it will be exceptionally sensitive. Tai chi should be about natural movements and postures, so if you can hold static postures reasonably well, but you notice shooting pains at particular movements, that might well indicate incorrect technique. If like me and your knee is weak for a few days, you will naturally pay attention to knee position throughout the form to ensure it is correct. Perfect! After all, we are training our concentration and body awareness abilities and there's nothing like pain to keep you focused! It seems that tai chi can be found in some unexpected places in nature! Researchers have shown that mosquitoes use the principles of tai chi (i.e. a yielding to incoming force rather than resisting it) to fly for through the rain. 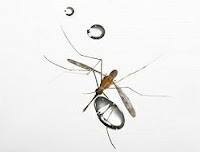 The mosquitoes also used rotation to escape the effects of surface tension, which could be analogous to the spiralling twisting action of frequently used in tai chi. A more extensive write-up can be found here.